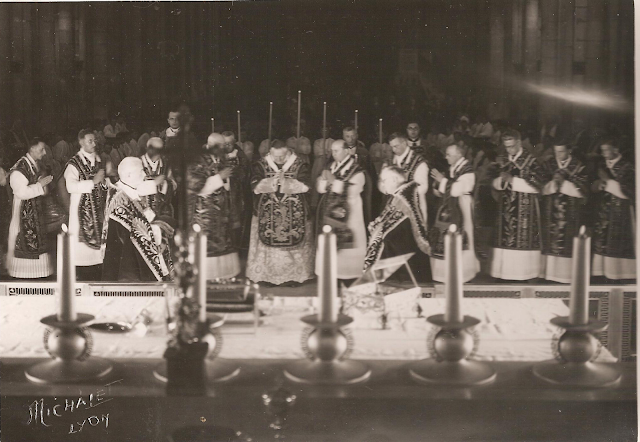 In point of fact, I still have an obligation to finish Part II of the "Ceremonial Details" for NLM, but I couldn't resist today sharing two new images that have come forward, showing the pontifical liturgy of the rite of Lyon in all its glory, courtesy of Bernard Berthod, author of many fine books on the liturgical arts (look him and his work up, you won't regret it). The first image shows the Primate of Lyon, Pierre-Marie Cardinal Gerlier, primate of Lyon from 1937 until his death in 1965, seated in the cathedra of the primatial cathedral, with the characteristic gremiale and also the six priest "concelebrants' around him -- to which were also added seven deacons, seven subdeacons and seven acolytes. 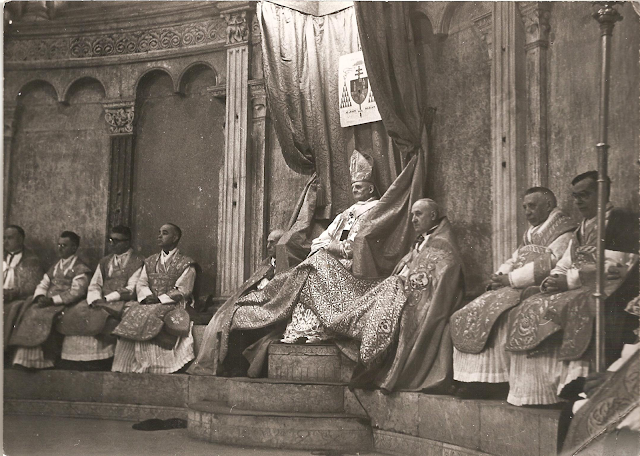 This next image shows the same Cardinal, surrounded by the priests, deacons, subdeacons and acolytes aforementioned. Visible behind are the seven candles of the acolytes. 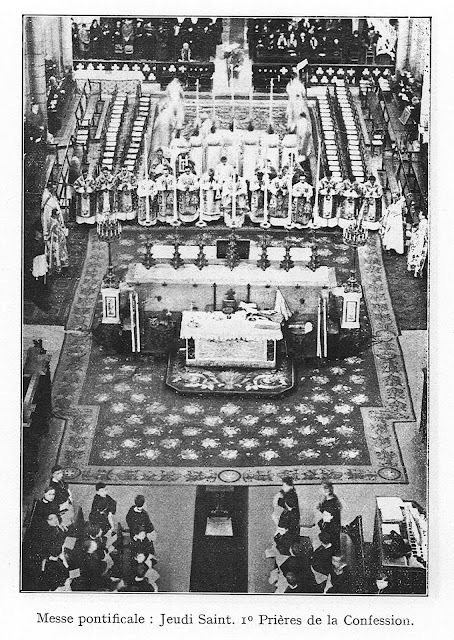 Given the smaller candles on the altar (seen in the foreground), one presumes that this particular photo was taken in the 1960's when the archeologist tendencies had gained fashion. For context, another view of this point of the Lyonese liturgy can be found here in an image I posted some years ago on NLM. There too you can see the more traditional altar arrangement with its, in my estimation, better proportioned candles and candlesticks.